I've been doing a lot of waiting this month. And I think I need to share the misery. I've waited for Feroci, my Ducati Multistrada 1200 S, to be repaired and be returned to me. But there have been delays, only a relatively small one from the manufacturer, but a much larger one from the people who were supposed to do the ceramic lacquer coat, and I quote, "in one day". I've waited as a direct consequence for my KTM 390 Duke to go in for a major revamp as well and haven't really ridden Ferocitas because the rear damper is shot to hell. There's a new shock, new (stock) stickers and so much work on that bike too. It's been waiting because Feroci has to come back first. I've waited for a series of manufacturers to hand over their test bikes too. The issues have ranged from logistics problems to crashes during testing - thankfully not from us though it could happen to anyone, as well as, regrettably, paperwork delays. At least I got to test a few motorcycles before I went to Italy to ride the MV Agusta and SWM (Superdual T) models. Sigh. I've also been waiting for July to come around because then it will be time for me to head back to the racetrack. I really do enjoy my time there, especially now that there are a reasonably good number of small to large sportsbikes for everyone to ride. And there is Feraci, my Yamaha R6, that waits patiently for me to come and ride it. But July is two months away. Sigh. 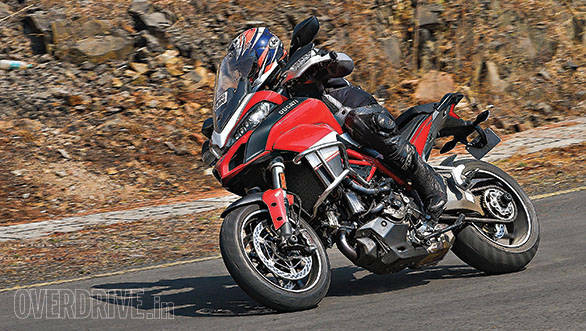 I waited almost all-day yesterday to climb into the saddle of the MV Agusta Brutale 800 yesterday and it proved to be a fun, but ultimately short ride. The demands of the story, interviews, meetings, video shooting and photography work, inevitably make riding the bike for longer periods hard. Sigh. Why can we not have 36-hour days, eh? Almost in comedy fashion, I've also waited for packages to arrive. The Dainese pants I wanted are probably at the end of their lives and about to be replaced. So I've struggled to find them and three times, count them, three times I've had money refunded after the seller decided after I'd placed the order that they did not have stock. Sigh. Still outstanding is a tank bag for the Ducati and KTM I've purchased whose mounting hardware showed up while the bag hasn't - the eBay seller was on holiday, he later told me. Sigh. But I believe the universe is a benevolent near-sentient thing. It sees you stuck in the pattern and it hears all the sighs. And then it decides to intervene. Some nice chap comes along and hands you a key to a motorcycle. Which starts up at the prod of a button like a puppy first thing in the morning. All it wants to do is play. All the waiting is just gone in a flash. Like sleep when said puppy hops on to the bed and decides to lick your face until you have no choice but to laugh and join in the fun. Four corners later, the sun is out. If not the real one, the proverbial one to be sure. All the waiting is forgotten and all there is, is the here and now. The next turn-in point, the next apex and the next fast exit. Passing scenery that blurs by cheerfully and beautiful vistas that appear, hold your gaze for a moment before you surrender your attention to the road once more. Whose powerful call drowns out every other voice, including your own. It engages each and every one of your senses. You can taste the pleasure and hear that booming roar of a man-made engine that has brought us so much pleasure over the last century. You feel the vibration of it running, of the tyres gripping tarmac and of so many more things. Your skin tingles as it sorts out the sensations and completes your picture of the world around you. A picture your brain will use to decide what to do next. And all this while, your eyes search for what is coming towards you. The glorious thing called the real world where motorcycles live and blossom. Where there is no waiting but only the here and now. Where the sigh is about how great the last ride was and how the next one must be greater still. Motorcycles. Just writing about them makes me stop sighing and think happy thoughts. How can you not love them, right? And then, just in times, comes a little missive from the Universe. "Your bike is ready!"